Pledge to Support the End of Breast Cancer! Pledge to do all you can to help bring an end to breast cancer once and for all! Every 13 minutes a woman dies of breast cancer. And two of the biggest risk factors are the ones we cannot control: getting older and being a woman. If we're going to see a decrease in the number of deaths from this deadly disease, we need to renew our commitment to eradicating it completely. Doctors and scientists are working hard to produce breakthrough findings that will make strides toward this lofty goal. But we can also come together and declare a real end to breast cancer. If we as individuals vow our own commitment to staying healthy, being as informed as possible, and educating others, we stand an excellent chance at accomplishing this goal. Pledge to inform yourself about the benefits of early detection. Encourage family members and friends to do the same. Talk to your doctor about the realities of breast cancer. 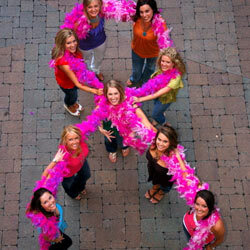 Then sign the pledge and declare your dedication to saying goodbye to breast cancer forever! · Eat healthfully and exercise regularly. · Visit my doctor yearly. · Perform at-home, self-administered breast exams often. · Share important breast cancer facts and information with loved ones. · Protect myself when exposed to the sun. · Keep a positive attitude! That's 6,882 signatures! Let's keep the ball rolling.